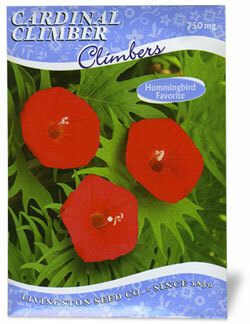 With twining vines of bright green, fern-like foliage and crimson trumpet shaped flowers and is a hummingbird's favorite. Suitable for arbors, trellises, fences and posts and can grow up to 15-20 feet! These easy-to-maintain plants will grow almost where in your garden. Garden Tip: Soak seeds overnight before planting to increase germination.